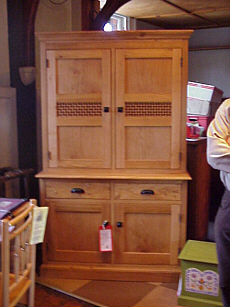 VISIT US FOR HIGH QUALITY, LOCALLY MADE FURNITURE AND CRAFTS. This is the shop where you can see local craftsmanship in many forms - from a small toggle for your light pull to a Welsh dresser, three piece suit or dining table . If you can`t see it, you can have it made as you want it. 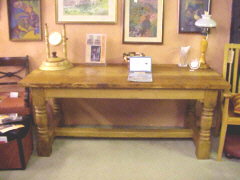 A large, quarter cut English oak loose leafed, farmhouse style table by Jerry Bryce-Smith of Bishop's Castle. 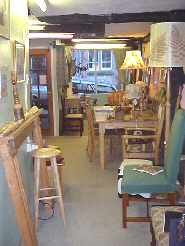 We sell for fellow members of Bishop`s Castle and Clun Valley Real Furniture and Craft Group as well as other makers working in the South Shropshire Hills, from blacksmiths to glass cutters, traditional upholsterers, cabinet makers, wood turners, lampshade and curtain makers. 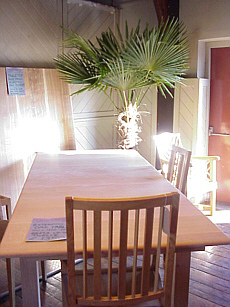 Gaham Radley made this burr oak table with an under carraige of re-claimed oak. We also sell work by two local artsist. Water colours by Sally Chappell and oils and acrylics by Matthew Bedell, both of Bishop`s Castle. Call or e-mail us, Jane and Stuart Carroll, to find out more.